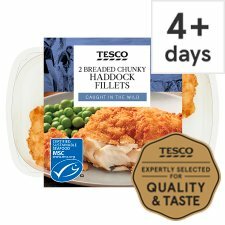 Breaded haddock (Melanogrammus aeglefinus) fillets. 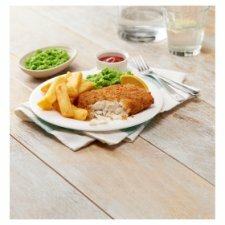 INGREDIENTS: Haddock (Fish) (68%), Wheat Flour (Wheat Flour, Calcium Carbonate, Iron, Niacin, Thiamin), Rapeseed Oil, Wheat Starch, Durum Wheat Semolina, Salt, Yeast, Rice Flour, Sunflower Oil, Colour (Paprika Extract), Black Pepper. Instructions: 220°C / Fan 200°C / Gas 7 28 - 33 mins Place on a pre-heated baking tray the centre of a pre-heated oven. Instructions: 220°C / Fan 200°C / Gas 7 33 - 38 mins Place on a pre-heated baking tray the centre of a pre-heated oven.